...With a trend for 1920's inspired movies taking place at the cinemas this year - The Artist and The Great Gatsby being the main influencers. Fashion has too turned to the roaring 20s for inspiration. With designers including Ralph Lauren (The label behind the designs of the original Great Gatsby movie) and Gucci channeling the flapper look in their spring summer collections and magazines dubbing 'The Gatsby Era' as a big fashion trend for the season ahead. Karl Lagerfeld has also channeled the 1920s in an editorial he's photographed for the recent issue of US Harpers Bazaar. Shot in black and white -signature Lagerfeld, the result is simply divine. 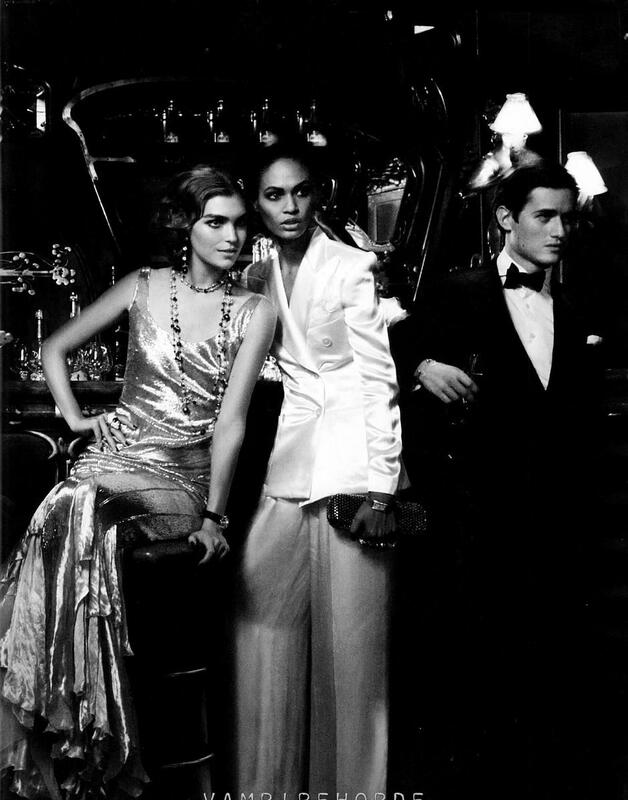 Short waves, elegant bias cut gowns and double breasted trouser suits are worn by three of the worlds top models - Joan Smalls, Arizona Muse and Saskia De Brauw. The third shot is my favourite of the bunch, like a still from an old movie, Arizona looks beautiful and authentic to the time and her dress is utter perfection.